1st Battery Artillery M.S.M. – Missouri State Militia, 1st Battery. Posted at Sedalia, Missouri with two (three?) 12-pdr field howitzers and four 10-pdr Parrotts. Captain Albert Waschman organized this battery in May 1862. However, Captain Charles H. Thurbur commanded in the winter of 1863 (Waschman was demoted to Lieutenant in May that year). With the 2nd Battery M.S.M. discharging in the fall and early winter, the 1st M.S.M. was the only such on Federal rolls. Attached to 5th Cav. 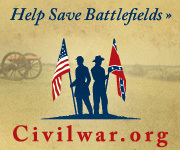 – With the ditto marks, I would assume this indicated a detachment from the 1st Battery posted southeast of Sedalia to Waynesville in support of the 5th Missouri State Militia Cavalry. Companies A, E, and H, under Major Waldemar Fischer, were posted to that town. No guns reported specifically for this detachment. 6th Volunteer Cavalry – “stores in charge.” With more dittos, this line is vague. The 6th Missouri Cavalry was at Milliken’s Bend, Louisiana but active throughout the winter in the operations against Vicksburg. No cannon listed, but there was some ammunition reported. A line with a lot more dittos – We have a location of Millikin’s Bend to work from. And four 12-pdr mountain howitzers. 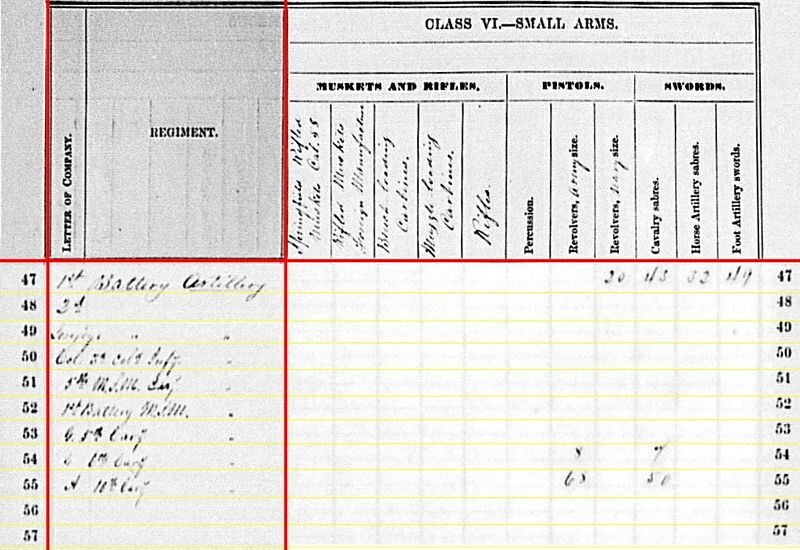 One battery unaccounted for is Captain Clemens Landgraeber’s 1st Missouri Horse Artillery. The battery was posted to Young’s Point at the time, part of the First Division, Fifteenth Corps. Landgraeber’s battery had howitzers. So that is my leading guess. Later in the year, the battery would receive a new designation – Battery F, 2nd Missouri Artillery. But we’ll table that for the moment. One other battery often cited as from Missouri, and not accounted for in the list, is Walling’s Battery, of the Mississippi Marine Brigade. 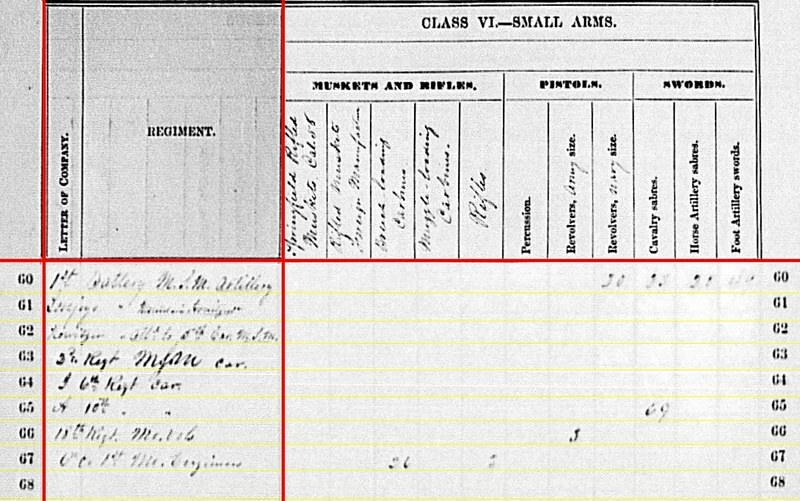 Dyer’s indicates the unit was first formed as Battery C, 1st Pennsylvania Heavy Artillery (later re-designated 3rd Regiment). When assigned to service on the Mississippi River, in early 1863, Captain Daniel P. Walling commanded. The battery operated with Brigadier-General Alfred Ellet’s Mississippi Marine Brigade. However, it was not until later in the war that the battery’s association with Missouri was set with another re-designation – Battery E, 1st Missouri. 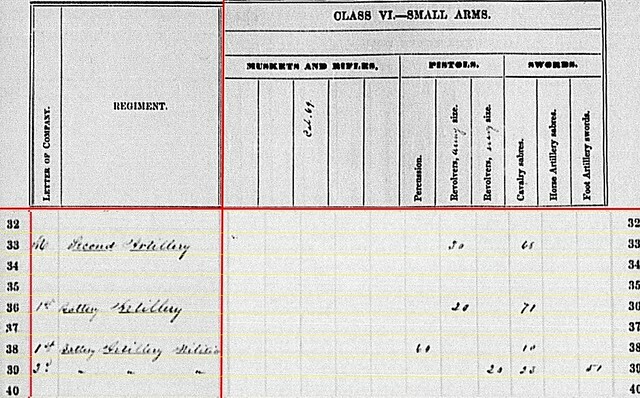 Quarterly returns through 1863 listed the battery under the brigade’s name, and not under a state affiliation. 1st Battery, M.S.M. – 36 shell, 124 case, and 16 canister for 12-pdr mountain howitzer. 6th Cavalry (stores)- 228 shell for 12-pdr mountain howitzer. 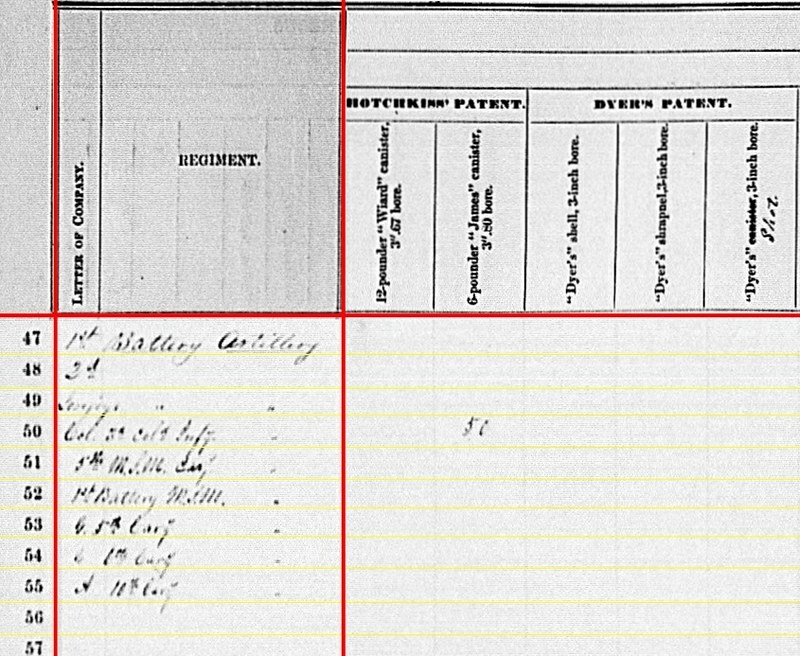 1st Missouri Horse Artillery (again, my guess) – 116 shell and 112 canister for 12-pdr mountain howitzer. So did the 1st Battery, M.S.M. have field howitzers or mountain howitzers? 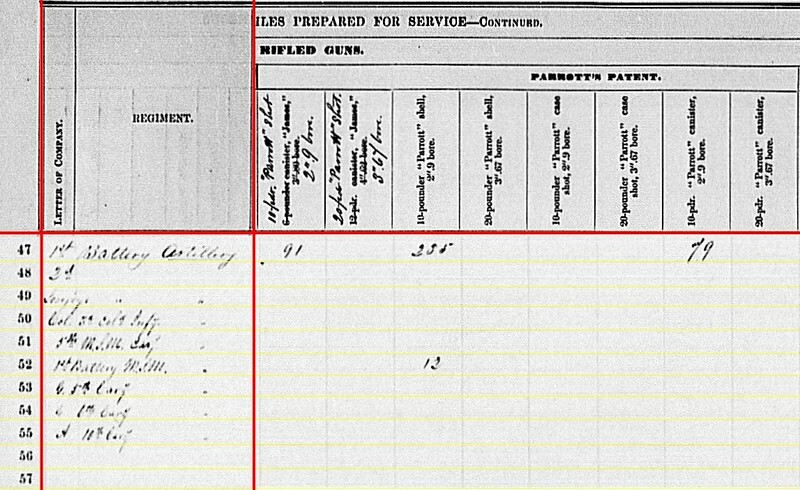 Are the cannon tube tallies incorrect? Or are the ammunition table numbers in the wrong column? 1st Battery, M.S.M. – 333 Parrott 10-pdr shells, 80 Parrott 10-pdr canister, and 100 Schenkl 10-pdr shot. And that is all for the rifled projectiles, with nothing indicated in the remainder of the Schenkl columns or those of Tatham’s. 1st Battery, M.S.M. – Twenty Navy revolvers, thirty-three cavalry sabers, and fifty horse artillery sabers. A good number of edged weapons for that militia battery. You see, Thurbur’s men were not just hanging out at the Missouri State Fair during their time stationed at Sedalia.